Many industrial zones in the world are susceptible to the impact of the weather and other natural events. Problems with the availability of gas, electricity, ICT, water, sewage and road transportation – ‘lifeline utilities’ – are a crucial factor. With climate change, the probability of lifeline-utility failure is likely to rise significantly. Lifeline utilities are vital for industry in terms of keeping production going and of safeguarding the supply chain. Different industries rely on lifeline utilities in different ways. Electricity, ICT and road transport are generally the most critical utilities but others may be vital for specific industries. In industrial zones and individual industries, operations must resume as quickly as possible after nature-related incidents. In association with the World Bank, Deltares developed a generic approach to designing business continuity plans for industrial zones. The central concept is the business continuity framework, which is known from the literature but which has now been used by Deltares to develop a semi-quantitative tool. Important factors are the duration and the seriousness of the failure of the lifeline utility, the scale of the industrial zone and the geographical extent of the natural hazard. 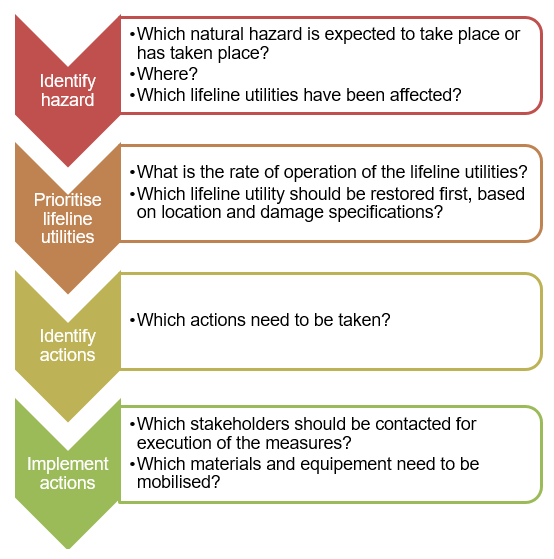 Criteria were developed to determine the consequences of the failure of a lifeline utility, with operational continuity costs and damage to reputation being identified as the most important. In combination with the probability of the natural hazards, all the factors have now been made available for an assessment of the risk level. Cascading is an important consideration. This is seen when the outage of one lifeline utility results in the outage of another (for example when a power cut results in the loss of ICT availability). Deltares developed the CIrcle software as a specific tool to analyse cascade effects. If the risk assessment shows that it is important to take action to address the leading risks that have been identified and to protect the competitiveness of the industrial zone and its individual industries, a Business Continuity Plan (BCP) should be established. The plan will include a step-by-step approach to help industrial zone managers with decision-making before, during and after an emergency. This approach consists of hazard identification, prioritising lifeline utilities, and identifying and implementing actions in emergency situations. The method has been applied successfully to an industrial area in Tuzla, near Istanbul in Turkey. Key to this success was that the method allowed incomplete or qualitative data to be used alongside quantitative data and assessments. Workshops are therefore deemed essential for the risk assessment and the development of the BCP.